By the time Arsen and I got engaged we had been dating for just over two years. Looking back that doesn't sound like much time at all. But by that point in our relationship I was ready. You can read all about how we fell in loooove in this post. Even though we met in college and were not planning on it turning into anything serious, it did. By the two year mark in our relationship it was one of those situations where we knew we would be together forever...so why wait? Plus, I wasn't exactly the "normal" college age. I was 25 when we graduated. Yes, it took me seven years (off and on) to get a Bachelor's degree. So I felt pretty much ready in that way as well. But I had no idea when it would be happening. 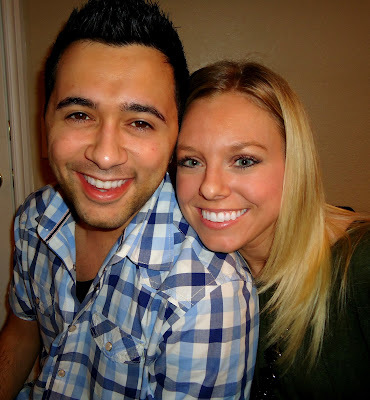 We moved to the Dallas area after graduation in May of 2010. I got an apartment with my friend Amelia, and he was living with his brother to save up some money. I had a feeling it would be coming soon...but he kept throwing me off! Our two year anniversary came and went on September 19th. My 26th birthday passed by on October 12th. Nothing. I wasn't yet to the point of frustration, but I was definitely curious. 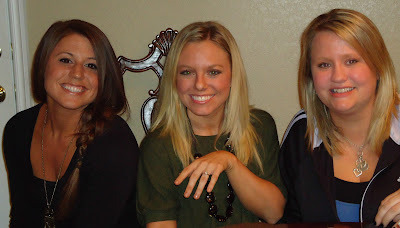 One weekend in late October we headed back to Oklahoma for OSU's Homecoming. Homecoming is a BIG deal for us...supposedly it's "the biggest Homecoming in the nation". Not sure if that's a fact, but people sure think it is. So we were both super excited and had been talking for weeks about our plans. On Friday we took the day off work, and headed north on I-35 early in the day. The plan was to drop Addie off at my mom's house in OKC and then head to Stillwater for something we call "Walk Around". All the Greek houses decorate these crazy elaborate displays and thousands of people walk around and look at them. It's always a great time because you're almost guaranteed to run into someone you haven't seen in forever, plus it involves tons of reminiscing about the good ole days. Well, on the way to Stillwater it started to rain. I was being a huge brat that day, and was like "Ugh, I don't want to go to Walk Around in the rain! That sounds miserable! Who are we even meeting up here? What's the point of driving all the way to Stillwater if we can't even do Walk Around?" and my favorite complaint, "Arsen, seriously I don't want to ruin my new boots!". I'm sure he was rethinking his decision every minute of my whining. Finally when we were about 15 minutes out the rain stopped. The sun was out, and I was happy again. We drove into town, and instead of going straight to campus he took a little detour through his old neighborhood. The house that he lived in when we met is near and dear to our hearts. It's the place that we spent all of our time together in the beginning. It's where we fell in love. It was a dirty college boys house, but I will always love it. We even named our little fur baby after that place. It's on a street named Admiral, so that's where Addie originated from. I love driving by it, just because of all the great memories it brings back. We drove by, drove around campus a bit, and then instead of looking for a parking spot he drove back to the Admiral house. This time, he pulled up in front and parked. I was super confused, because it is way too far from campus to walk all the way to Walk Around from there. He turned in his seat to look at me, and started saying all these adorably sweet things, about how much he loved me, and how happy I made him, and how he couldn't wait to spend the rest of his life with me. I know by now anyone in their right mind would probably have put two and two together, but I just thought he was being sweet. Didn't even cross my mind that something special was going on until he jumped out of the car and ran around to my door. The minute he opened his door I knew. He opened my door up, and got down on one knee. He said " Stillwater is where we met, Stillwater is where we fell in love, and Stillwater is where I want to ask you this question. Celeste, will you marry me?" I had a reaction that I never expected myself to have when I was proposed to, and to this day Arsen won't let me live it down. I started laughing! I was so happy, and so shocked, and so overwhelmed, and so giddy....I just smiled and laughed and said "Oh my God!!" a lot. And of course, I said "YES!!!". And put that beautiful ring right on my finger. Arsen was upset there were no tears, but I'm not really a happy crier. I cry when I'm sad, but when I'm happy I usually get uncontrollable giggles. So I guess it was to be expected. After the proposal, he hopped back in the car and took off out of town. I was even more confused now. I just assumed we were meeting up with friends to celebrate. But we headed back toward OKC. Obviously I called my two best friends, Rachel and Katie immediately. They were both super sweet and excited and happy for me, and I'm so glad they were the first people I spoke to. I didn't call my mom since I knew by that point that we were heading back to her house, and I thought I would call my dad when we got there. The 45 minute drive back to her house was a fun one. I kept staring at my ring, laughing, and saying "I can't believe this!". We got to my mom's house, and I couldn't wait to walk in and give her a hug and show her my ring! I walked through the back door, through the hall, and into the kitchen....and my mom, my dad, Rachel and Katie were all sitting at the dining room table!!! I started jumping around and yelling "Yay!!! Oh my God, I can't believe you guys are here!!!" and giving everyone hugs. I couldn't believe that he was so thoughtful to have all the people who he knew I loved most in my life waiting there for me. We spent the night eating cake, drinking champagne, laughing and talking. It was really just such a special night, and I will absolutely cherish it forever. What a sweet proposal story!! Obviously he put some thought into it! That's so sweet. So sweet! :) I love that you guys named Addie after such a special place too. Yay! 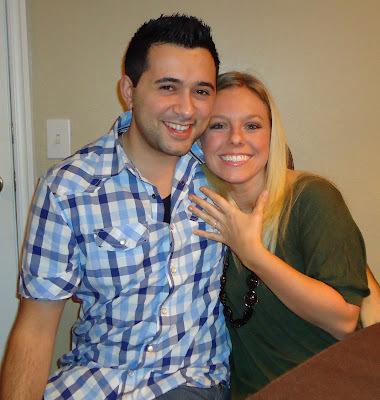 What a great engagement story!! Such a sweet and thoughtful proposal by your guy!